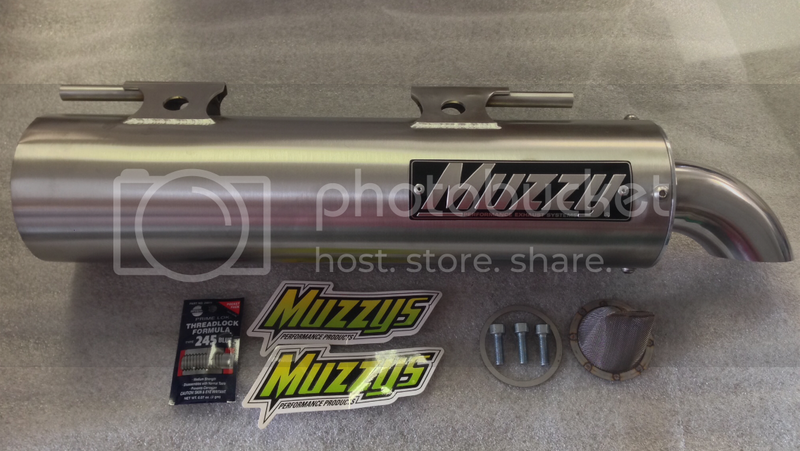 I'll be doing some testing this weekend (time permitting) on the new Muzzy Slipon exhaust system. I will be testing it BONE STOCK on my second blue base model 2014 teryx. 14-15 models use a factory a/f sensor, so this will keep a/f in check. Just adding the slipon, see what happens. Then adding the PCV tuner and the slipon together. Then I'll be removing the catalyst and tuning with the PCV and Slipon with airbox mods and custom tuning. Here's what it looks like. I got the first Slipon Muzzy to test with. These are 100% full t-304 stainless (end cap is billet) this includes spark screens and quiet core (pre installed in muffler) You can run either core insert together, individually, or remove them both. This muffler core is the LARGEST Muzzy has made for offroad use. Plus the full stainless build and full welded inlet make this a very stout well built muffler, and should prove to be very reliable piece. Install should take minuites. 3 bolts to the header and 1 10mm nut on a bracket. Very simple straight forward design and install. What will it do on the dyno?? we'll have to see. As always, I'll get you the best prices on these setups. Here's what it looks like and what's included in the setup. there is only 1 finish option on this setup. No polished or black. Have you done any further testing on this particular combo? I have a 14 Teryx 800 in need of a serious performance upgrade. Its still under warranty so I am looking for the best possible bolt on bang for my buck. I'm hoping you have a PC-V, maps, exhaust combo now available for the newer 800's?